We're kicking off our fourth Game of the Year feature with a bang, featuring three very different but very deserving games released in 2012. And if things seem a little too mainstream-friendly for your tastes, we'll follow things up this afternoon with a list of honorable mentions from Spencer, our resident PC curmudgeon. Buckle up, friends. It's gonna be a wild ride. Game of the Year lists tend to be predictable. They seemingly highlight only the biggest titles of any given year as defined by mass appeal or technical innovation. This trend (one we’re also guilty of, in part) is understandable: to praise the blockbusters is to recognize that the biggest titles usually have the most to offer thanks to larger budgets and staff. And while smaller games will occasionally slip by and rank well, the typical outcome is to see more of the same. Trends in the industry beget trends in yearly awards -- a self-fulfilling prophecy of sorts. Such malaise is hard to overcome. As we've said in the past, we Silicon Sasquatch staff buy our own games. Much of our content comes from what we’re playing casually, and not what we’re playing on deadline. Logic follows that because we play what interests us we might forget to ask ourselves just how a game defines its year. I challenge our readers to think of these awards not as a list of our favorite purchases, but a group of the most unique experiences throughout 2012. For me, Nintendo Land is the game that defines this year. Not because it’s perfect or even better than games that didn't make the cut, but because it heralds the arrival of the Wii U with a flamboyant volume I never would have expected. I can also thank Nintendo Land for making me laugh, and yell, more than anything else I played all year. Its bottom ranking is certainly not indicative of poor quality. The opposite is true: Nintendo Land made our list because it’s the game that translates Nintendo’s vision for their new platform. However, the superb mini-games are just miniature pieces in costumes borrowed from beloved Nintendo franchises. Noticeably absent are full Metroid, Zelda and Pikmin titles (among others) at the beginning of the Wii U. Even so, Nintendo Land dopes players with unceasing waves of nostalgia; these are feelings left dormant since the Nintendo 64 launch. In many ways, the experience transported me back to staring in awe at Super Mario 64 on my parents’ tube TV 16 years ago. Perhaps the Wii U will fail in the way the Wii did: occasional first party releases mixed with scattershot third-party shovelware. That’s an impossible bit of clairvoyance mixed with pessimism. Yet right now, in 2012, what I know for certain is the virtual theme park’s lovingly segmented heritage can be adored by anyone who ever smiled playing old school Nintendo cartridges. For instance, each time I loaded “The Legend of Zelda: Battle Quest,” a co-operative on-rails shooter, I didn't feel restricted by the scope; instead, I felt myself nearly tearing up with joy over playing beside my best friends as one of my favorite characters. The experience of Nintendo Land is unique and is unmatched in 2012. Some might scoff at seeing this “party game” bookend a list of the year’s top titles. In all honesty it’s hard to convince anyone who hasn't played Nintendo Land that it matters. But it most certainly does. In a year that’s seen a dearth of originality (including some of our top 10 picks) and several releases suffixed by the numbers 2 and 3, it makes me overjoyed that a launch title can both justify the existence of its hardware and be so damn fun. I’m not terribly good at Hero Academy. Earlier this year, I wrote an article to that effect. Since then, it hasn’t really changed. I’m still pretty much the Washington Generals of Hero Academy: Want a win? Play me. But you know what? Despite all the losses I’ve racked up, I still find Hero Academy charming and fun. It’s been almost a full year since the game came out, and in that time, I’ve downloaded a number of games to my iPhone. None have kept me as interested for the long haul as Hero Academy. The real question is why. Why this game? Well, that’s the thing: It’s still an incredibly well-balanced game, by any standard. While we want to have a diverse group of titles on various platforms (as Aaron alludes to in talking about Nintendo Land), we also don’t want these to be consolation choices. This is not the Token Mobile Game on our list; it’s worthy of being in our top ten. You can see this inside your first game of Hero Academy. Too many iPhone games have the depth you’d see in checkers; this skews more toward chess. Five moves per player turn let you make real progress while still remaining bite-sized. The game’s character classes are well-established tropes -- healer, ranged attacker, up-close attacker, magic user, and super character -- and balanced against one another. Each of the factions make interesting tweaks to how the base class play. When I first started playing the game, it was incredibly basic -- humans vs humans. Once the game grabbed me, I bought the other available race and started to discover the differences. Despite having all the same units, their skills and play styles were quite different. Once further races were released, these differences multiplied and became even starker. What’s best is that, thanks to Hero Academy’s free-to-play system, you can buy the races you like and skip the others. The iPhone and iOS as a platform are five years old now. Take a moment to let that sink in. Typically platforms really tend to come into their own at that point in the cycle. Developers come to understand the strengths and weakness of the technology and can perform some creatively interesting feats. I played many an iOS game this year, both on my iPhone 4/5 and on my new iPad. I certainly played the largest volume of titles on those platforms, possibly even spent the most time and money on them as well. Not all games are winners, but there’s no denying that it is a radically different platform now. Gone are the old mobile ports, gimmicky touch games and nonsensical fart buttons (those still exist, of course, but they are fewer and farther between, lost in a sea of better apps). More than any other mobile title, however, what truly grabbed my attention this year was Hero Academy. It’s a competitive one-vs-one tactical game that is ideal for a device that is always on you and is always connected. It usually takes less than a minute to take a turn, and it can be thrilling to have a constant back-and-forth with friends. Matches rarely feel unfair and even unfavored odds may still present a winnable scenario. Hero Academy is a free title that is funded by in-app purchases of mostly cosmetic goods, like avatars and team colors, as well as some bonus teams that have been released since it’s start. Each comes with a new set of strengths and weaknesses to be understood, and they have the balance that many games with IAP lack. As fun as it can be to constantly steamroll Doug, it would get boring fast. I have certainly had my behind handed to me on several occasions in public matches but each ends in a teachable moment. The strategies for using each team and how they match up against each other are fascinating, and I’m always learning new techniques from random matches. Years from now, Far Cry 3 won’t be remembered for its tepid story, its relatively limited mission structure or – with the sole exception of the wonderfully sardonic antagonist Vaas – its dearth of fascinating characters. What we’ll look back on with admiration are the systems that bring its world to life and the serendipitous delight of chaos erupting when you least expect it. It’s strange to think of Far Cry as a series of games because there’s not much connecting them thematically or even in terms of gameplay. The original Far Cry was an audacious and beautiful but flawed first-person shooter that planted the player in the military boots of a super-soldier in a me-against-the-world battle with countless trained soldiers – and then it took an insane turn about halfway through and shifted gears into an asinine science-fiction plot at the cost of enjoyable gameplay. Far Cry 2 moved the setting to Africa and opened the environment up to the player, resulting in a more unpredictable and engrossing experience, but it suffered from a lack of player direction and a clear sense of progress. 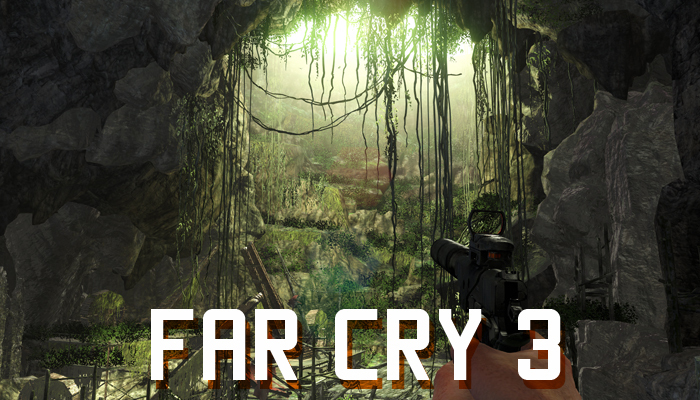 Far Cry 3 reconciles the strengths of its predecessors in a pretty remarkable way. You’ve got the fast-paced combat and and “scout first, ask questions later” design that defines the series, but it’s brought to life by a vibrant and deadly ecosystem of predatory animals, flammable foliage and remote-detonation explosives. I took a methodical approach, tagging each enemy, taking out the scouts with silenced weapons or close-in stealth kills, and clearing out the rest with a quick shotgun blast. If I captured a base without raising an alarm, I considered it a success. I think what sets Far Cry 3 apart becomes clear when you spend just a little time exploring the game’s rich environments and tackling the many tasks it sets out for the player. The game nails that wonderful balance of structure and chaos to the point where I found myself constantly surprised by the way the game’s building blocks – vehicles; pirates; predatory animals; and the original videogame catalyst, the exploding barrel – would combine in unexpected and often hilarious ways.